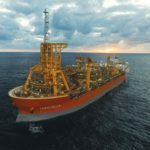 Royal Dutch Shell plc expects first production this year from the Stones project in the ultra-deepwater Gulf of Mexico. Discovered in 2005, Stones is located in the Walker Ridge area about 200 mi (322 km) offshore Louisiana in about 9,500 ft (2,896 m) of water. Sanctioned in May 2013, Stones consists of an FPSO (Floating Production Storage and Offloading vessels, or FPSOs, are offshore production facilities that house both processing equipment and storage) connected to subsea infrastructure located in the Lower Tertiary play. Shell is 100% owner and operator of the Stones project. The development will start with two subsea production wells tied back to the FPSO with six more production wells to be added later on. The reservoir depth is around 26,500 ft (8,077 m) below sea level and 17,000 ft (5,181 m) below the mudline. At first production the Turritella will be the world’s deepest floating production unit at 9,500 ft.